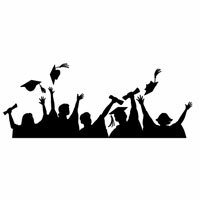 This cling rubber stampfeatures a silhouette of graduating students following the tradition of throwing their hats in the air when the graduation ceremony is completed. 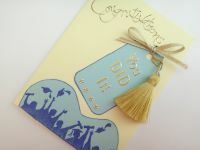 Perfect for graduation congratulation cards and scrapbook pages. The stamp can be mounted on an acrylic block for easy use. Size 9.5cm x 4.5cm.